Reynolds professionals include the ultimate specialists in the design and construction of intakes for high-capacity water supply systems. Our extensive experience includes surface water intakes, infiltration galleries, combined aquifer and surface water intakes. These intakes have ranged in capacity from several thousand gallons per minute (gpm) to over 150,000 gpm, including intakes constructed in alluvial and cohesive soils, bedrock and mixed-face conditions. Built for municipal and industrial customers, our surface water intakes include conventional river bank structures with mechanical screens, submerged pipe intakes with static screens and tunneled intakes with drilled “tap” connections into the lake or river bed. 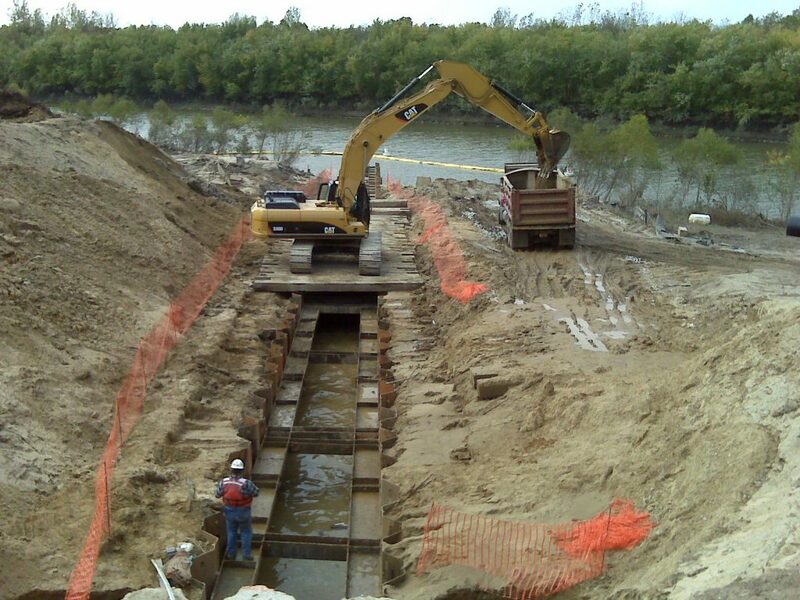 By their very nature, these projects call upon all of our skills and experience in cofferdam construction, shaft excavation, underwater blasting, excavation and marine pipe installation, and the actual pump station construction itself. Our self-perform capabilities also include large, deep vertical shafts, heavy concrete work, hard rock tunneling, marine work and intake pipelines common to large intake construction. Reynolds' fixed-screen surface water intake design contains almost no moving parts, keeping O&M costs extremely low. Our specialized construction techniques incorporate trenchless technology for sinking/building the reinforced concrete caisson that serves as the wet well pumping station, and for installing the intake line(s) that deliver water from the surface water source into the caisson. This technology minimizes disturbance during construction and operation, often simplifying the permitting process. The intake screens are positioned and designed to optimize fish protection and hydraulic efficiency, minimizing plugging and facilitating self-cleaning where possible. Automated backwash systems complement this design to ensure the screens remain open.